House of Jen: Who's ready for a bathroom remodel? Who's ready for a bathroom remodel? 7:30 on a Saturday morning, makes the perfect time to start my master bath reno. Everyone is still alseep, so I can sit in peace and plan my Home Depot shopping list. This bathroom will make 2 out of 3 remodeled and the one I have disliked the most, mainly due to the lack of storage, and the fact the counter top is 5 inches shorter than normal. All I've wanted since we have moved in is drawers! Most of the time the counter is so cluttered you can't even see it, which I completely understand is my own fault. It's not Brian's makeup all over. 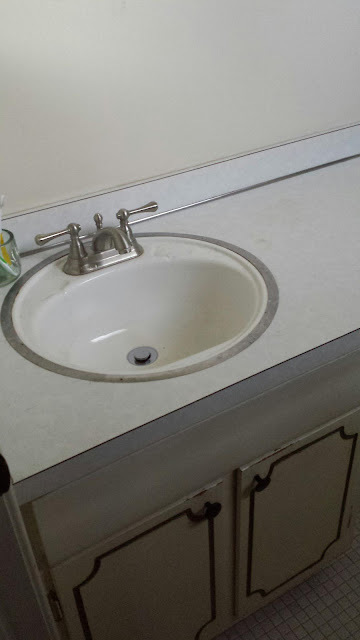 I wanted Carrera marble counters, however I almost feel over at the price, over 700 bucks, for that little space, Umm I don't think so! I was thinking the new Formica 180 in marble. Which I was sent a sample and seems petty awesome. When my dad suggested tile. The first thing that came to mind was the 12 by 12 granite tile counters with horrible grout lines. However the Tile Shop had 12 by 24 pieces of beautiful marble, so after the layout with the sink, we will have 1 maybe 2 grout lines, so not a bad compromise for high end marble.